The Chocolate Museum is a fun place to visit for anyone who loves chocolate, regardless of age. Here, among other things, you can take a guided tour and learn how chocolate is manufactured or see exhibitions of amazing chocolate statues, for example, football players and Disney characters. Chocolate exhibitions and sculptures change depending on the time of year that you visit the museum. There are also activities for both children and adults where you get to try different things, like making chocolate sculptures and drawing with melted chocolate, mix chocolate and brandy, or to taste different kinds of chocolate in the dark. Everything is really about chocolate in this magical place. There is also a lot of interesting information about the history of chocolate, from the discovery of cocoa beans to the modern mass production. Of course, you can buy different kinds of chocolate and even shirts that shows what kind you prefer. 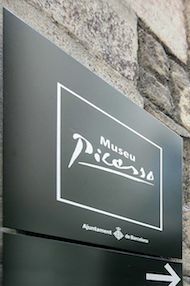 For those who are interested in art or want to learn more about the famous painter Pablo Picasso, there is the Picasso Museum in Barcelona. 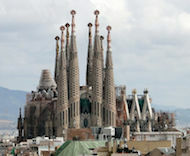 This museum is one of the most popular in Barcelona and is visited annually by thousands of people. The fact is that Pablo Picasso studied and lived in Barcelona during his studies and there is much to learn about his life in the city. The exhibitions mainly focus on Pablo Picasso's formative years during his time in Barcelona. Overall there are over 4,000 works by Picasso to see at the museum. Outside Barcelona in Castelldefels, about twenty minutes from the city, you’ll find The Olympic Canal. 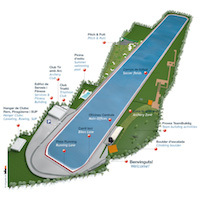 The Olympic Canal was built for the Summer Olympics in Barcelona in 1992 and it was there that all the water sports competitions were held. Today, there are remains that are a very popular tourist attraction where you can try out various water sports. Water bike, pedal boat, canoe and kayak are just some of the sports that are available. Parc de la Ciutadella is a fantastic park located in Barcelona's medieval centre. The park appears as a green oasis in the city and this is an opportunity to stroll among the flowers and rare plants. In addition, the park is adorned with beautiful fountains and sculptures. To take a walk in this park can be very relaxing after having spent time on the streets of Barcelona. 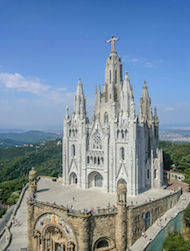 In the north-eastern outskirts of Barcelona you’ll find the mountain peak The Tibidabo with a height of 512 metres. This is a popular place for tourists to visit because here you get a fantastic panoramic view of Barcelona. On a clear day you can even see much of the scenery inside the country. Up on the mountain there’s also an amusement park, the Catholic Church Temple del Sagrat Cor and the TV tower Torre de Collserola built for the 1992 Olympics, and an Amusement Park called Parc d'Tibidabo Funfair which opened in 1901, giving it a unique old world charm. The attractions combined with the view and the older charm gives something extra compared to other amusement parks. The top of Tibidabo can be reached by car or by the roller coaster Funicular de Tibidabo. MACBA is a museum of modern art which is art created from the 1950s until today. The works come from well-known artists including Pablo Picasso and Judith Berry. Like most art museums, this museum also has both permanent and temporary exhibitions. Which temporary exhibitions are being displayed you’ll be able to check up before your visit to Barcelona on MACBA’s website. In addition to the art exhibition, you have the building itself which is very interesting to view. It uses light and small galleries to showcase the art, making the architecture pretty special. The museum is otherwise pretty big and really it's a bit excessive for what's inside. MACBA is open every day except Tuesdays. Holy Family Penance Temple (Sagrada Familia) is probably the most popular attraction in Barcelona. Here you can really see what a genius the Catalan architect Antoni Gaudi was. Antoni Gaudi was commissioned to build this huge church in the late 1800s, but never had time to finish, and construction continues today. The construction is financed by donations, and various architects are now continuing the work that Gaudi started. It is an impressive sight from both outside and inside. Many feel an almost spiritual experience here and one should take the time to really enjoy the works. The queues can be very long so it is best to buy tickets online in advance. One tip is to be at the location early in the morning or in the evening when there are usually fewer people. Palau Güell is another example of Antoni Gaudi's amazing work, and for some, strange ideas. Originally, it was a fine manor, a palace, which was designed for the great industrial tycoon EusebiGüell.There are many details in this amazing house, such as the small window on the upper floor where the family could see the guests who came to visit, without being seen themselves. In the large banquet hall, there are high ceilings and even here it is full of small holes where lanterns were hung at night to give the impression of a star-filled sky. To learn as much as possible during your visit, you can rent an audio guide. The building is a UNESCO World Heritage Site. Palau de la Música Catalana, or The Palace of Catalan Music as it is called in English, is described as a tribute not only to Catalan music, but also to music in general. This stunning building was designed by the modernist architect Lluís Domènech i Montaner in the early 1900s and is today a UNESCO World Heritage Site. Anyone can stand and watch from the outside, but if you want to go inside you must either take a guided tour or go to a concert. Many believe that this is one of the most beautiful buildings in the world as it was designed and built in a wonderful Art Nouveau style. The Gothic Quarter (Barri Gotic) is a nice part of town which is full of small streets and alleys where you will find several nice cafes and beer gardens. It is also full of small squares, as well as several shops. This is the old and historic part of Barcelona and the architecture is very beautiful. You’ll be treated well in most small shops and it’s definitely a place you’ll want to come back to after your first visit. When it comes to food and drink, it is a delightful mix of old and modern. It's very nice to just wander around here, sit down and have a cup of coffee, and then continue your adventures on the streets of Barcelona. Santa Maria del Mar (Saint Mary's by the Sea) is a very nice old basilica in the Catalan Gothic style built in the early 1300s. Above all, there are many fine art treasures found inside the building as well as the very special architecture, with a beautiful ceiling and the many stained glass windows at the top, which attract visitors from all over the world. 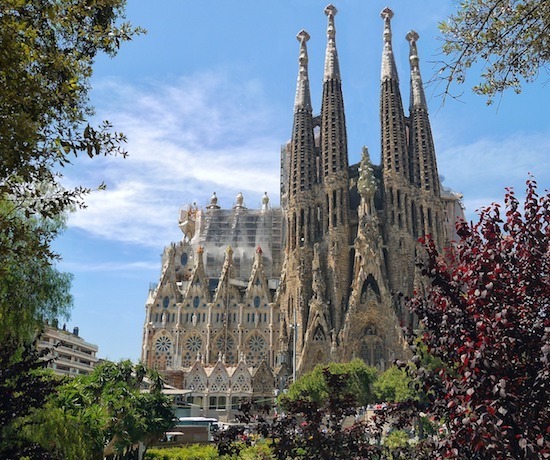 If you want to, you can take a guided tour of the Santa Maria del Mar where you’ll get a lot of interesting information about the history of the basilica and the opportunity to go up on the roof. Flamenco is something you absolutely must experience while in Barcelona. There are several places to go and see this passionate dance and art form, performed with guitar accompaniment, singing and clapping. Most Flamenco shows include a dinner and some also have other entertainment. At Castell Medieval, for example, they organize a medieval evening with flamenco in an old medieval castle. Before the flamenco show, one can see a horse show and a display of medieval knights. The food is also medieval in style. A fun place to visit is also La Casa Vella. Here you can dress up in flamenco clothes in front of an authentic background with guitars and fans and take a picture, which can be a fun memory from your Barcelona stay. CosmoCaixa is Barcelona's Science Museum. A visit here can be a very interesting and enjoyable experience for the whole family as it suits all ages. There is much to see and do at CosmoCaixa and you can see the various technical and scientific things work by testing them yourself and experimenting. It’s really excellent for children because it’s not a normal museum where you just walk around and look. There are also a lot of major attractions such as a rainforest with all its inhabitants, the geological wall, an aquarium and a planetarium. Admission is relatively cheap at only four euros, but for some of the exhibits there is an extra charge. Casa Batlló is another cool building designed by Antoni Gaudi. The building has a skeleton-like facade that is covered with mosaics of glass and ceramics. The ceiling looks like the back of a large dragon. Some say that the Casa Batlló is an ingenious work while others think it is pure folly, even if it is the really skilful work of Antoni Gaudi. It is not only the facade and exterior that is fascinating—even inside the Casa Batlló, there are interesting things to see and discover. Among other things, there is really cool furniture and a fascinating interior. The house was built in the early 1900s by industrialist Josep Batlló Casanovas, and you'll find some interesting information about the Batllós family who live in the house. Casa Milà, or The Quarry (La Pedrera in Catalan) as it is also called, is also an astonishing work of Gaudi. The name "La Pedra" comes from the part outside of the house which looks like an open quarry. The house was built by the developer Pere Milà, hired by Gaudi with the goal of building a house that would surpass the Casa Batlló. 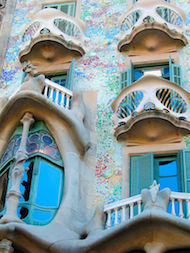 The house was built between 1905 and 1910 and, like the Casa Batlló, Gaudi chose to avoid straight lines. Instead of bearing exterior walls, the building has an advanced steel construction. Casa Milà is clearly a very fascinating building that should definitely be seen by anyone who has the slightest interest in architecture and building structures. For those who not only want to view the work but also find more in-depth information, it is possible to go on guided tours or rent an audio guide. One can also take a separate evening in the Casa Milà which is a very special experience. To avoid the long queues during the tourist season, it is a good idea to purchase tickets online in advance. The Old Town is a very nice place to walk around in and to eat and drink something good at one of the many cafés, do some shopping and people-watch. There are several small streets and alleys, and in the middle of Ciutat Vella is a large square. In this part of town there’s a ton of little nice shops that sell many fine things (not just a bunch of souvenirs). Many people like to come here and walk in the evening, experience the atmosphere, eat some tapas or just have a good time. There are also many fine old buildings that can be seen. Ciutat Vella is right next to the Barri Gòtic.